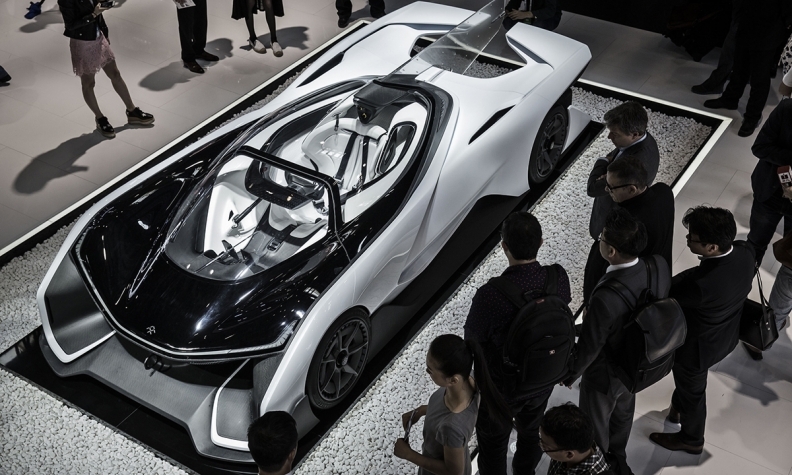 The 1,000-hp Future FFZero1 concept, seen at the Beijing auto show. The dwindling empire of China's Jia Yueting, who once boasted he would leapfrog Tesla, faces a new hurdle as his U.S. electric car startup struggles to raise a $500 million funding round, people familiar with the matter said. A convertible note of more than $400 million, with a 12 percent interest charge, becomes payable immediately if Faraday & Future can't raise the Series A round by December, the people said, asking to not be identified as the matter is private. The electric carmaker, which is also dealing with about $100 million of unpaid bills, hasn't been able to line up funding after months of searching as it tries to pay off Chinese investors who financed the debt, the people said. Jia gave up control of his crown jewel, a Netflix-like business in China, this year and turned his focus to Faraday, which has ambitions of combining Chinese cash with Western technology skills to challenge Elon Musk's Tesla in EVs. Part of the company's problem with fundraising is an inability to get mainland regulators to approve transfers of money out of the country, one of the people said. "We decline to comment, other than we acknowledge that we are in the process of our round A fundraising," the company said in a statement. Faraday made global waves two years ago when it unveiled a 1,000-hp prototype that looked like the Batmobile at the CES technology show in Las Vegas. Jia planned to erect a $1 billion production plant in the Nevada desert and create 4,500 jobs manufacturing cars by 2017. But work on the plant later stopped as Jia admitted that his LeEco empire faced a cash crunch after growing too quickly and across too many product segments. In addition to the video streaming business, Leshi Internet Information & Technology, his businesses developed smartphones, movies and TVs. Now, Faraday needs the additional cash to be able to produce actual cars, rather than prototypes. In May, the company was seeking to raise $1 billion, a person familiar with the matter said at the time. If the $500 million funding succeeds, the debt will convert into shares, the people said. LeEco directed requests for comment to Faraday. Jia scored a lifeline in January when property group Sunac China Holdings and other investors bought 16.8 billion yuan ($2.54 billion) worth of shares in Leshi and other related companies, $1.52 billion of which was in exchange for stock owned by Jia, who later stepped down from leading the company. Faraday has already had at least one $30 million bridge loan, the people familiar said. Employees are also owed bonuses and 2016 pay increases, the people added. The company sought out investors that valued the business at between $1.5 billion and $2 billion this year, but potential investors walked away after component makers and media partners demanded money for unpaid bills and Chinese courts began to freeze his shares, the people said. Tata Motors, the Indian carmaker that owns Jaguar, strongly denied Chinese media reports that it had invested $900 million in Faraday at a $9 billion valuation. Stefan Krause, who was CFO before leaving in October, prepared filings for a Chapter 11 bankruptcy while searching for alternative funds, people familiar with the filing said. Jia ultimately killed the plan along with all other proposals that would result in him losing control of the business, the people said. Mahindra & Mahindra of India was interested in becoming a "stalking horse" to set the opening bid as part of a court-supervised auction, the people said. Mahindra declined to comment. Faraday said it "terminated" Krause and former Chief Technology Officer Ulrich Kranz, according to a statement posted on its website this month. Both men, alumni of BMW, told Bloomberg News they quit in October. They declined to comment further on the terms of their departure, pending potential legal action.